I married Rosemary in 1968 and after all these years there are many times when we need not communicate what we are thinking. We know. As sometimes described as a peculiarity of identical twins, Rosemary can start a sentence and I will finish it as if our brains were joined somewhere above (or perhaps below) our medullas oblongata (or that could be medulla oblongatas). Today I picked our new Craftsman mower at Sears in Richmond. At this stage of my gardening career I never thought I would need to buy a new mower. I think only newly married couples can get excited about jointly shopping for a new fridge. But now if Rosemary and I were to do such a task I would be as limp as a defective crisper. When I went to the see the grand old man of things Craftsman at Sears (I call him the old man because I have never asked for his name even though he has now sold me three lawnmowers) I said, “My mower works just fine but I need a new one. This one is 7 years old.” He looked at me and said, “It has rusted out.” He knew! Until today, and even today I was careful to wear my glasses. Since the upper part of my mower has gaping holes from the rusted out top, when it mows the clippings, dust, dirt, dangerous, little pebbles and I have a most intimate relationship. 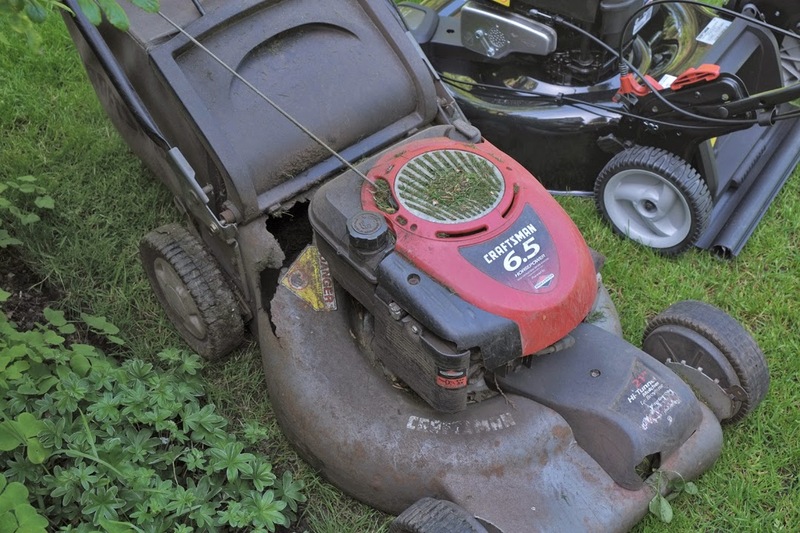 I am putting the mower in the back lane with a sign that will read “It still works if you patch up holes.” To make sure that if someone wants to take it home and might put it into a car trunk I decided to mow until the gas ran out. In fact I was able to mow the entire boulevard and the front lawn before it did. 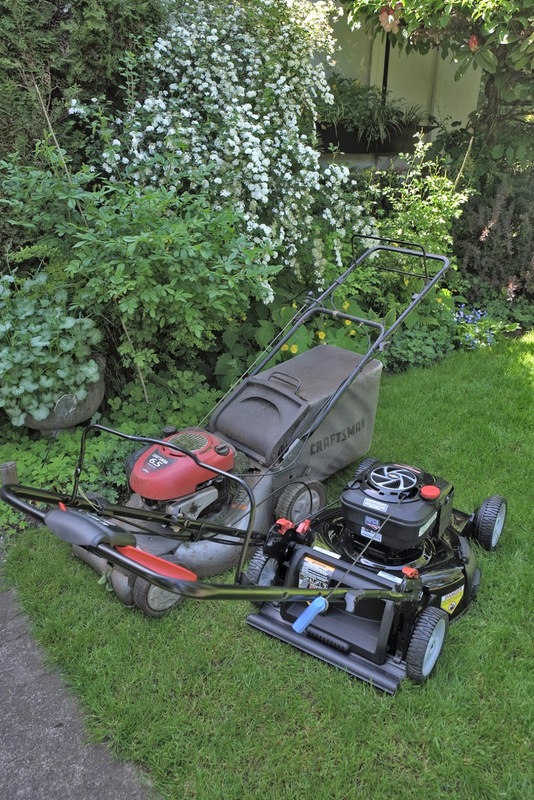 I then place it by the new mower and took these two pictures with my Fuji X-E1. The old mower has been faithful even though I have tempted that terrible mechanical reprisal of all things mechanical, resistentialism, by never having changed the air filter or the oil. I just kept adding oil every year. This mower would have out-competed my former mother-in-law for resilience under pressure. I am sad to see her (mowers must be of the female kind I believe) go. She looks so forlorn in my back lane waiting for some poor soul to take her away to what could be a new life in those Elysian Fields-of-the-sky (not the one in Hoboken, site of the first organized baseball game and birth place of Frank Sinatra). She (my mower) would mow forever on a perfect lawn and would never need gas, oil or blade sharpening. And the sweet smell of the cut grass would not be polluted by that of weeds of any kind. Perhaps gardeners and their mowers do eventually meet again. Will that happen to me?